Pricing for our room booking and resource scheduling software is determined by the maximum number of "venues" you wish to manage, and the maximum number of user accounts required. A "venue" is essentially any bookable facility, such as an individual room or space. For example, if you wish to schedule bookings and resources for five meeting rooms, three lecture theatres, a sports hall, and a library; then you would be scheduling a total of 10 "venues". A "user" is any individual requiring a dedicated login to your scheduling system. It's important to note that this is not a "per workstation" or "per device" charge - A user will be able to login to MIDAS from any computer, laptop, tablet, or mobile device with modern web browser and a network connection to the server where your MIDAS system resides. MIDAS also includes "public booking" and "public booking request" facilities which if enabled allows members of the public to check the availability of your venues and make booking requests. As theses "public" features do not require a login or user account, use of these feature won't contribute to the total number of users for your MIDAS system. So, if you have a total of five members of staff who will be handling the day to day booking and scheduling of venues at your organization, (or who need to be able to view more extensive booking information to that which is available through the "public" booking request feature), you would need a five user license. 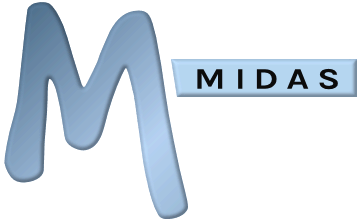 By default, MIDAS allows up to schedule up to 10 venues with a single user account, however, when purchasing you can incrementally increase either of these limits up to "Unlimited" to suit your particular requirements! You can also upgrade your license to add additional venues/user accounts at a later stage if your needs grow. Can multiple people share the same user account?